I have never felt that I belonged so much to a place in such a short time nor so far from my origins as much as in the Mixteca. The women, the team, my Nana and Flavia, the river, the way to Tlaxiaco, the van (pitufa)...they were within me and it appear they had always been. This project changed my perspective of the (architecture) profession, and it was after participating that I realised what it was that I wanted to do and how to do it. The main thread of any project, whatever the discipline, must always have a human side. This aspect, over the last years has become strange to some, but here lies the grand value of truth. The humility, dedication and the desire to excel were so ingrained, I learned so much and those trips to Mixtepec and Ayuquililla will be etched forever within me. Travelling thousands of kilometres to an unknown place and being surrounded by people that you may never see again. Giving everything for someone you do not know and finally the place becomes your home and these people your family! It was worth it! "To feel it we need to do it" was something that Dominga, one of the women, once told some Canadian journalists that came to find out about the experience in the Mixteca. 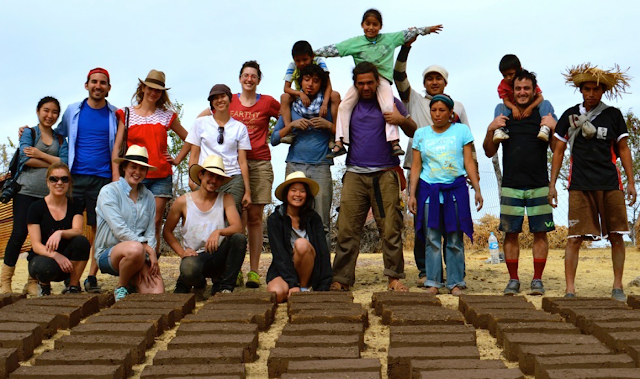 For me it was a frase that simplifies the time that goes by as we build with the women of Ayuquililla and San Juan Mixtepec. To learn or feel there is only one way, and that is doing things, doing what you think and feel. The experience of spending two years in the Mixteca has left us with a lot of knowledge. I have learned a lot more than you can learn in any school of architecture. Making honest architecture. Twenty students in a van gong up the mountain, always happy; was an experience shared with both with friends who came to build as well as the local people; putting your hands in the mud and teamwork based on each ones capabilities! (Adobe bricks weigh so much!) Enjoying the generosity of the people who received us, they treated us like we were family sharing food with us and the joy of seeing how slowly but surely things get done. For me the most important thing about this experience was to see how these villages are dignified through these buildings of traditional architecture using local materials, confirming that you can build a comfortable, safe and affordable house with the materials you have on hand without needing go into town to get cement. In the case of the people of the Mixteca, with Adobe for Women, I found it exciting to see how women were empowered and were able to organize themselves to build their houses. I had fun! I learned a lot! Thanks friends!